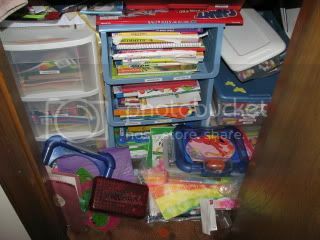 If you are interested in Operation Organization visit Melinda's blog Coming Clean: Confessions of an Imperfect Parent. 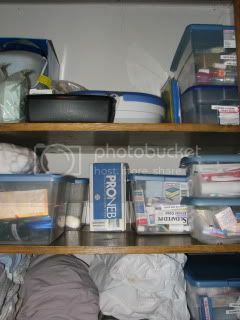 You may remember that my goal this week was my art supply/linen closet. Here are the before pics I shared last week. 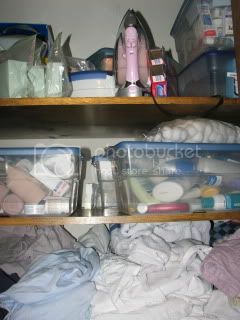 So I buckled down and spent hours cleaning out this closet! 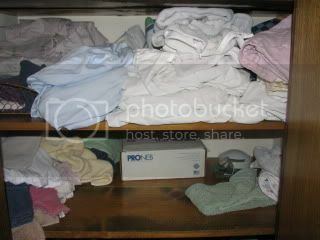 I threw away two bags of stuff, have a bag of old linens to donate, and here are the after pics. One problem I had was keeping all the sheet sets together. 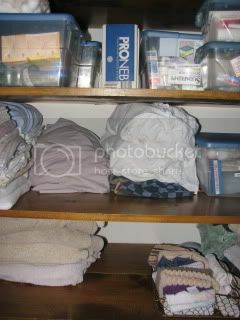 I heard someone say recently that they folded the fitted and flat sheet and put them inside the pillowcase! Brilliant! Used that idea! Three kitchen utensil and gadget drawers and my spice/baking supply cabinet. 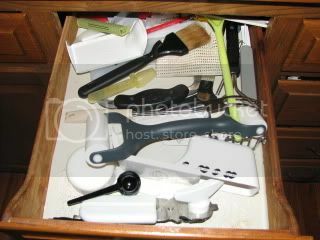 I love kitchen gadgets, now I need to find a way to find what I need easily. This just needs to be cleaned and purged! Come back next Friday to see if I succeed!!! Happy organizing! It looks great! I like how you have labels on everything, would help me remember what goes where - when things start to get overwhelming or messy. Wow! Your closet looks fabulous! Keep up the hard work! Your closet looks great. 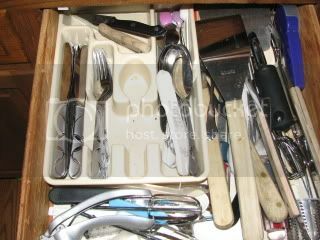 Wish I had one of these to organize. 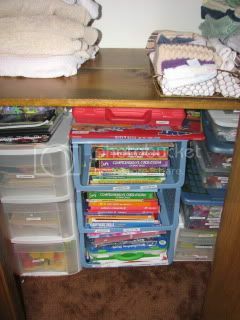 My supplies is covering my dining room table for now and my linens are stashed in a dresser drawer. I like the idea about keeping the sheet sets together in the pillow cases as well. Looks great! That must feel really good. 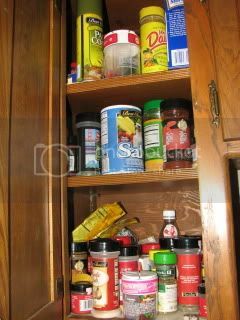 If you are going to do your spice cabinet, I had a friend give me an idea I've loved. I used some of those shallow plastic baskets and put spices together in those in categories. I wrote the spice name on the top of each container. Then when I need one, I just pull down the right basket and find it easily! No more pushing little bottles aside and over and knocking things down or out of the cabinet. Just what works for me... have fun! Closets are a scary place aren't they? You did an awesome job. Great idea about storing the sheets in their pillow cases. Such an easy remedy. Great job! I am on a mission myself, trying to get the house in complete order before the holidays. The closet looks great. I always feel much better when I purge and organize. It looks wonderful! Thanks for sharing your before pics. I am not alone! Wwow! Super-duper awesome!! You have inspired me. I need to tame the chaous in my art area too. Good job! What a great idea - looks great! Love those before and afters! I am a sucker for a organization. 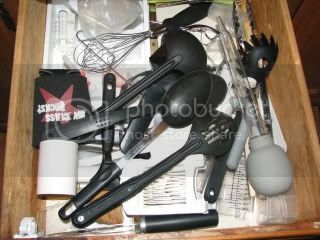 My drawer with cooking utensils looks like that too. I can never find trays large enough to hold them neatly together in one place! Can't wait to see how yours turn out.